Angelenos: Give Your Opinion on LA’s Haute Cuisine & Score $10 From Gilt City! If you’ve always wanted to give your opinion on the hautest eateries in Los Angeles and never had the time, here’s an incentive! 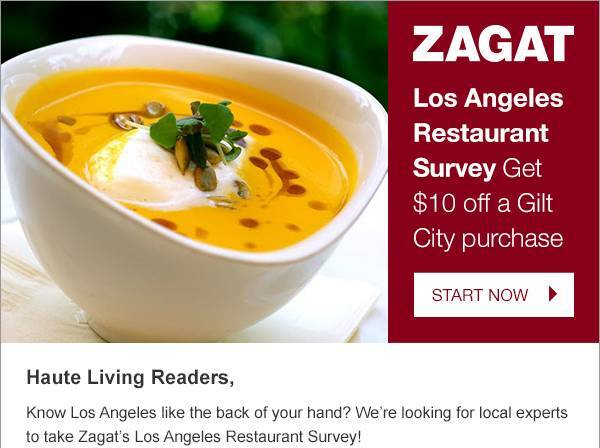 If you take Zagat’s Restaurant Survey and share your culinary experiences in LA, as a bonus, you’ll receive $10 off a Gilt City purchase. 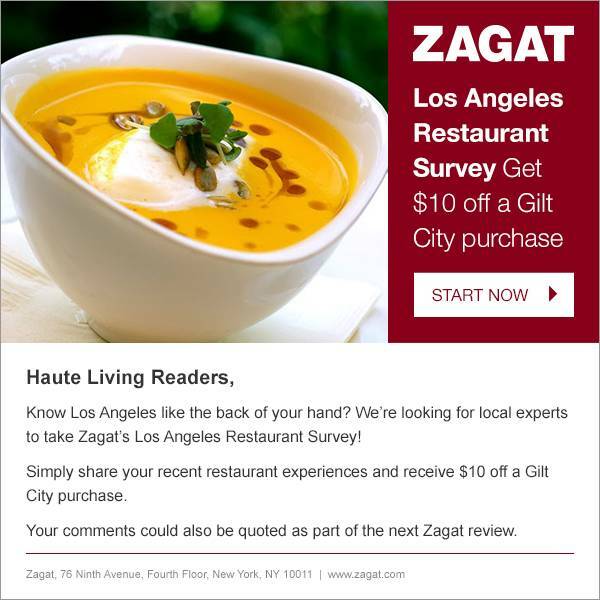 Your opinion will be seen by the experts of Zagat, of whose editorial team curates the best restaurants and nightspots and serves them up to you in a fun and accessible way so you can enjoy the best the City of Angels has to offer. So give your expert opinion today, and reap the rewards. Trust us, there are plenty — and they extend from everything like private flights on Surf Air to treatments at the Sunset Marquis spa to Cynthia Rowley eyewear. There’s only one word for this sweet deal, and that, of course is haute.